Reunion was a great Success! It was great to see you all again at the reunion. Attendance was very good this year. We had 49 Alpha Troopers at the reunion. We had several first timers and they really enjoyed renewing friendships with their former comrades. Our special name tags were a big success. If you did not have a 'Then & Now' photo on your name tag, get one sent into the website. We are working on Alpha Troop T-Shirts for the next reunion. Cost will be about $28.00. More information will follow. The 2010 reunion will be held in Tucson, Arizona from April 28th to May 2nd of 2010. We hope to see all of you there and hope some of you west coast troopers who could not attend this year will be able to join us. Of special note is the kindness displayed by the Alpha Troop members at the reunion. One of our reunion goals this year was to collect money to purchase memorial bricks for our fallen comrades. Alpha Troopers at the reunion contributed $3158.00 towards the purchase of bricks. Thanks to each of you who contributed to this cause. Once I get back to Tucson I will get the bricks ordered. We will be able to purchase at least 31 bricks for our fallen soldiers. Thanks for a job well done! A special thanks goes out to Mel Moss, Gene Yonke, Bob Rahnefeld, and Bill Baum who helped put together our brick donation project display. If you order a brick between now and the time I get back to Tucson please let us know who you purchase the brick in memory of so that we don't double order bricks. Visit the Memorial Bricks page for order forms. I enjoyed seeing all of you. We had a great time. Thanks for your support of Alpha Troop. As we move forward together towards the LD for the reunion, here are a few things we are working on. Please get the word out to all of your email contacts about these items. Specialist Justin Snell will be one of the 3/4 Cav's representatives at the reunion. He is a member of A Troop stationed currently in Hawaii. He will be arriving at Ft. Mitchell on June 26th. I know you will make him feel welcome. All Alpha troopers need to take him under their wings and take good care of him. 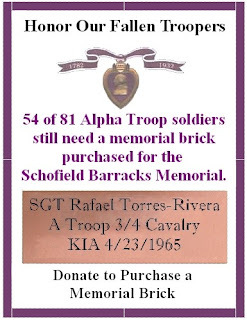 We are going to make a push to collect money for an Alpha Troop memorial brick fund. We still need to purchase bricks for a significant number of our fallen comrades. Look for this sign in the hospitality room or find Gene Yonke, Mel Moss, or John Moore. We may need helpers occasionally to sit at the collection table. We have made special name tags for Alpha Troop this year. If you are on the association's attendance list we will have a name tag for you. Find John Moore to get your name tag. Name tags will be at the Memorial Brick table if John is not in the hospitality room. Here is a sample of our name tag. Photos are different on each name tag. We have a reunion page on our web site. The list of attendees to the reunion is on our Alpha Troop Reunion Web Page. Congratulations on the Army’s 233rd birthday! With undaunted courage in the face of adversity and danger, the Army throughout our history has secured our freedoms and earned the respect and admiration of our citizens. In 178 campaigns from Lexington in 1775 to Iraq today our Army has served our Nation with honor and courage. Each of you can be proud of your contributions to safety and security of our nation as a member of A Troop 3rd Squadron, 4th Cavalry. Your service and sacrifice is valued and appreciated by each of us who served with you. Thank you for the job you did in A Troop and thank you for being there for your fellow soldiers. The Army Birthday message from President Bush is located at this link. Take some time this month to remember these fellow Troopers who served with us and did not return. They made the ultimate sacrifice for their country and for us, their fellow soldiers. They will always be in our memories. The following heroes were casualties during the month of June. Honor Our Fallen Comrades! Their memory can become a permanent part of the Schofield Memorial Monument. A memorial brick still needs to be purchased for Eugene Hilton. Go to the Memorial Brick page for more information. Through your kindness and generosity 5 bricks have purchased for our troopers since we began posting the monthly Hall of Heroes. Thank you! If you have a story about one of these soldiers or want to post a remembrance just select the comment link below.